RHA T10i review | What Hi-Fi? There’s only so much you can do within the confines of a headphone, especially the in-ear variety. 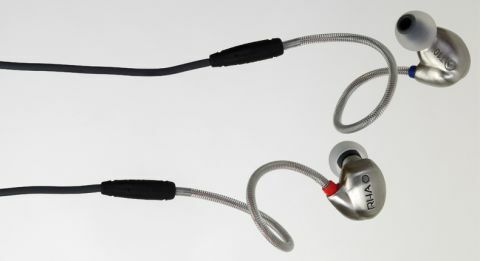 But RHA has managed to engineer its T10i buds so you can actually tune their sound to suit your musical taste. How? By selecting one of the three pairs of tuning filters supplied in the form of tiny, beautifully crafted pieces that screw into the steel housing of each earpiece. Each filter has been tuned to encourage a different balance of sound. They’re labelled ‘treble’, ‘bass’ or ‘reference’, with each given a different finish to prevent mix-ups. For a pair of in-ear headphones at this money, it’s hard not to be impressed by the look and build of the RHAs. The injection-moulded steel earpieces look intricate and delicate. The small logos in each side show great attention to detail – you’re even supplied with steel mounts to hold all the ear-tips and filters in place. The RHAs come with an iPhone-friendly, three-button remote and mic, so you can answer calls as well as skip tracks and alter the volume. Owners of other brands of smartphone will only have limited controls (RHA also does a normal T10 model, which loses the remote/mic combo). Each earpiece uses mouldable over-ear hooks to help with fitting. Manoeuvring them into place is more involved than with normal buds, but over time this should become easier, as the hooks mould to the contours of your ears. Once they’re in place, the T10is still manage to feel relatively lightweight despite their steel construction. As always, picking the right style and size of ear tips is vital to create a good seal in your ear, and RHA provides you with 10 different pairs to get the job done. These include silicone, memory foam and double-flange designs. We’re tempted to go straight for the dark ‘bass’ filters, but we resist and use the ‘reference’ ones instead. Play a quick blast of Royal Blood’s Better Strangers, and immediately the RHAs give you the impression they mean business. They produce a hard-hitting sound – drums are forceful with real intent behind each strike. The bassline to J Cole’s No Role Modelz follows the lazy rhythm of the track, but sounds meaty and powerful with it. Once you’ve become accustomed to their bold, confident delivery, you then become aware that these in-ears are lapping up more than their fair share of detail. It’s not the most open sound we’ve heard – vocals have a tendency to sound closed-in – but they still extract texture and nuance from the grimey Royal Blood guitar rifts. Switch to the delicate opening guitar play of James Bay’s Hold Back The River and this demonstrates the RHAs’ ability to pick out leading edges and communicate dynamic shifts with the listener. You can almost close your eyes and follow his fingers as he shifts from chord to chord. When the drum kicks in, the RHAs communicate all detail, texture and crispness explicitly. They are an exciting listen, but the more you listen, the more you realise that low frequencies sound imposing and overpowering. When tracks call for subtlety the T10is can’t seem to ease off, especially when using the ‘bass’ filters (more power and a fuller sound), but even with the ‘reference’ filters there’s just too much bass. Swap to the ‘treble’ filters and the soundstage opens up, with a little more clarity and a hint of extra sharpness to upper mids and highs, but the bass could still do with dropping down a notch or two. Long-term, their forceful approach to low frequencies can become draining. If you’re looking for a robust sound, you’re sure to get a real kick out of the RHA T10is. But headphones such as the Sennheiser Momentum In-Ears have a better balance at a significantly lower price.